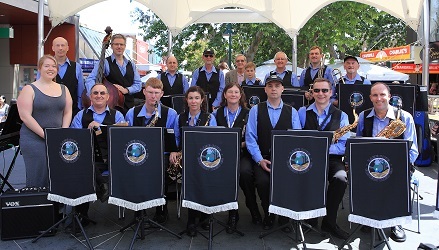 Stringybark Jazz is a Big Band that plays all styles of Jazz from Swing to Blues, Latin and Ballads. The Band plays at community events, festivals and citizenship ceremonies, and is also available to play at private functions for a small fee. Stringybark Jazz performs as a full Big Band but can also play as a small jazz combo consisting of 3 to 8 players. The band is always on the lookout for enthusiastic players to join the group who are looking to advance their skills and explore musical aspects such as style and improvisation within the jazz idiom. There is the opportunity to play in a wide range of exciting performances throughout the year. Previous experience in playing jazz is not a prerequisite for membership of the band, and the friendly, supportive environment provides the opportunity to mix and learn from more experienced players. When: The Band rehearses from 7:30pm to 9:00pm each Monday during the public school terms. Stringybark Jazz is always interested in inquiries from the community about new opportunities to perform.